Imagine you are at your favourite pub on a Friday night, you waltz in through the main doors after cutting the que and giving the bouncer a high-five as you are the pub’s MVP. You stride through the crowd giving other local patrons piston fingers as they scurry for a chance to buy you a drink as you are a local legend of the pub. By the time you reach the bar your usual stool has been cleared and the bartender has just placed your favourite beverage down and gives their usual wink indicating that this one is on the house (as usual). Life is good. 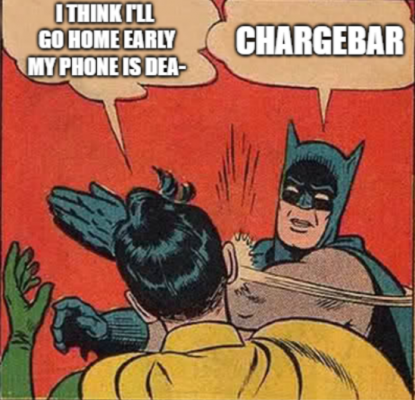 Normally this is the end of the Tinderalla story but with a Chargebar at your local pub there is no need to fear a power shortage as instant recharge can be delivered to all phones on life support. If your local pub doesn’t have any phone charging or re-charging facilities to bring phones back to life we’d love to hear from you and hook your local up with a Chargebar premium phone charging device! Here at Chargebar we don’t discriminate so whether it’s a pub, office, library, university, retail space ski slope or car park we would love to hear from you and get you connected and charged up to keep every one charging on!